All websites have now been transferred over to Moonfruit.com. Moonfruit (through their parent company, Sitemaker Software Limited), is the owner of the award-winning Sitemaker software that powered Newlaunch.net sites, and made the process of building a professional-quality website quick, easy, pleasurable and fantastically good value. 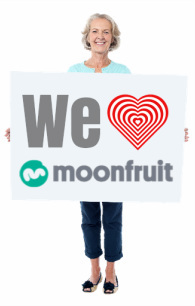 Moonfruit has been around for more than a decade and boasts a great design, technical and customer support team, all of whom are committed to providing excellent customer service to users. Moonfruit has hundreds of templates, a vast library of royalty-free images, a regularly updated blog and other useful resources (like video guides,) to help make your website a success. Your website(s) will remain hosted in exactly the same location, however your site address (i.e. the free “myname.newlaunch.net”) will change (e.g. “myname.moonfruit.com”). Just in case you were wondering, there will not be any change to your domain name (e.g. "www.myname.com"). Your pricing plan will remain the same, which represents excellent value, especially with the exciting new developments being rolled out in the coming months. Many thanks for your support over the years. It's been a pleasure and a privilege helping you launch your website! We wish you every success in the future with Moonfruit.